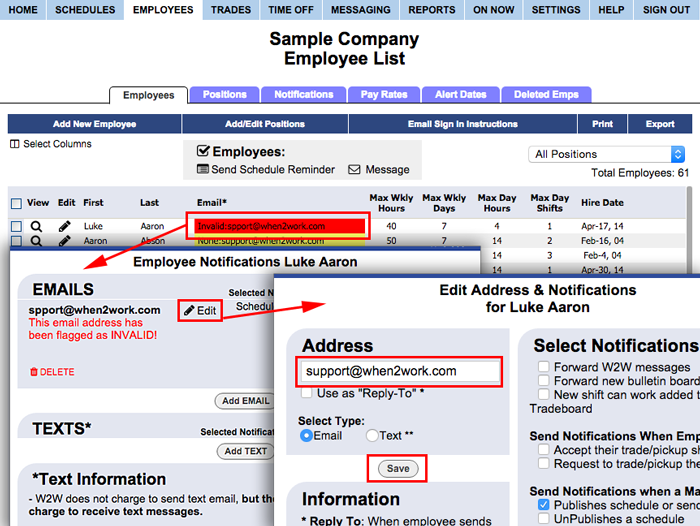 If an employee’s email has been marked “Invalid,” you will see a notice in the “What’s New” section of your manager home page. IMPORTANT: if an address is marked “Invalid”, it means it was entered incorrectly and WhenToWork was notified not to use that address. Please check carefully and be sure the address is correct before entering it again and make sure the employee does not have email problems such as spam filters that cause our emails to be returned. Periodically you should check your Employee List page and be sure that none of your employee email addresses have been changed to start with “Invalid”. If this happens, it means emails sent to that address have been returned to WhenToWork as undeliverable.